Huge news from our new company BIGUMAKU! It might seem like we’ve been quiet for the last couple of months, but that’s only because we’ve been working on something extra special. We are delighted to announce that through our gaming label, BIGUMAKU, we are releasing a new mobile game to tie in with the brand new Netflix Original Series, Hilda! 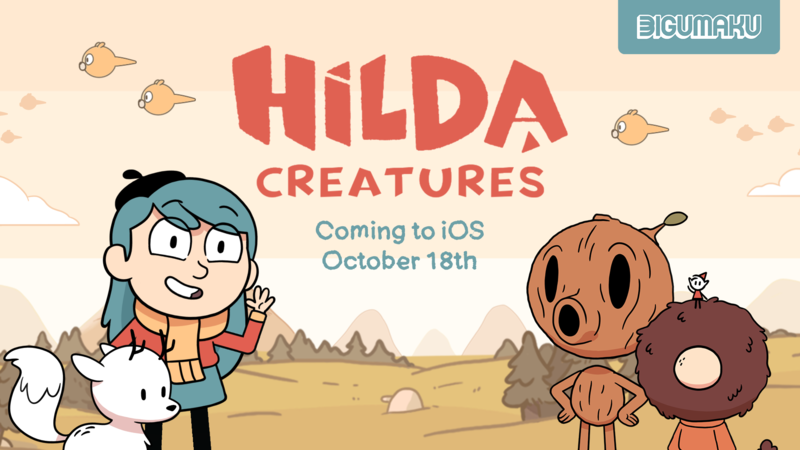 The enchanting world of Hilda Creatures is coming soon! Our little blue-haired adventurer is ready for anything, but with a big move to the city of Trolberg, she has a lot to learn. Will the creatures in the city be as interesting as those of her beloved wilderness? Join Hilda and friends on an adventure through many beautiful locations, meeting new friends and documenting the magical world around you! Learn more here. We are so excited to be a part of the Hilda project, alongside our sister companies Nobrow and Flying Eye Books, and Silvergate Media. It’s a huge honour to be working on our first TV tie-in, and we can’t wait to see what you think! Not watched the show yet? Check it out on Netflix here. Follow our pals @BIGUMAKU below to keep up to date with the latest news!